Stereo equipment is one more significant variable that can greatly affect the Classic Vinyl Listening Experience. In addition to the quality issues surrounding turntables and preamps, amplifiers, receivers, and speakers also greatly affect overall quality of sound reproduction. It is worth reminding you that these variables affect all forms of music playback, including CDs and tape recordings. In general there has been a very broad range of stereo equipment produced since the introduction of the modern vinyl record. Vacuum tube based systems of the 1950s and 1960s gave way to the transistorized systems that followed. That is not to take away from the quality of a good tube based system, as the change was primarily for cost reduction purposes. And while it is true that improvements continue to be made in stereo equipment, these improvements come at a substantial price. Many older pieces of equipment have much to offer in terms of price performance. 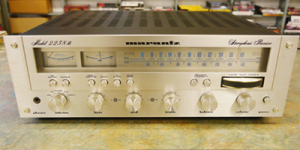 Also, since the 1960s, much of our stereo equipment has come from Japan, and while their overall quality was excellent up to the early 1980s, a steady decline in quality followed because of a desire to further penetrate the market with lower cost product. Most equipment simply got cheaper in price and quality, although high-priced equipment is as good or better than ever. Suffice it to say that the “silver faced” equipment of the 1960s and 1970s continues to offer a tremendous listening experience and can do so at substantially lower costs when compared to new, modern equipment.